Protestors at the US Embassy in Bangkok blow their whistles for two minutes Friday. One whistle being blown near your ears is annoying. Being in the middle of a crowd of thousands blowing their whistles in unison is ear shattering and physically painful. The anti-government protests continue in Bangkok. While there's been nothing as dramatic as the storming of government offices that we saw earlier in the week, but there have been daily marches to government buildings. These marches are carefully planned (scripted really). A group of protestors form up, march to their intended government office. Police have laid down razor wire and formed a phalanx around the office. 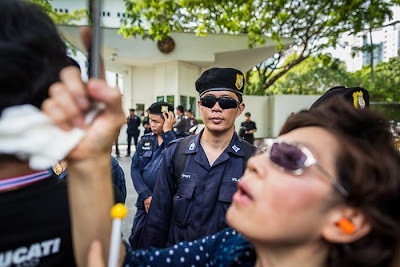 Protestors blow whistles, make speeches calling for the police to support their people power revolution and finally protestors give roses and orchids to the police. The protestors then march down the road a little before breaking up. Protestors march down Sukhumvit Road towards the US Embassy. Although most of the protestors do not speak English, many protestors carry signs in both Thai and English. So long as everyone stays on script no one gets hurt. There's almost a festive air to the whole thing. Friday protestors went to the US Embassy (among other places). I joined the protest at the Asoke Intersection, about 2 kilometers from the Embassy and walked with them to the Embassy, which is in a fortress like complex of building on Witthayu Road in central Bangkok. 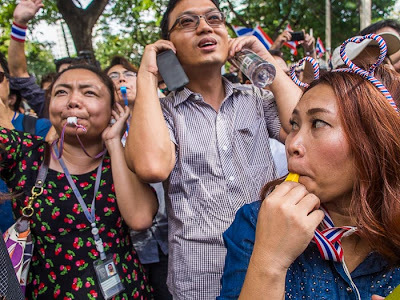 They were led by former Prime Minister Abhisit Vejjajiva, who made speeches and urged protestors on in their battle of wills with the elected government of Yingluck Shinawatra (Yingluck defeated Abhisit in the 2011 election). Former PM Abhisit Vejjajiva reaches out to supporters from his truck in front of the US Embassy. There were riot police on duty at the Embassy, but storming the Embassy was never a part of the script today and the general mood was happy. Anti-government protestors file past riot police at the US Embassy. Speakers took turns from the sound truck making speeches in both Thai and English calling on the US to support their peaceful revolution. The protest culminated in the massive whistle blowing that has become the trademark of these protests. A speaker called on protestors to blow their whistles in unison and with enough force that even President Obama could hear them in Washington DC. And blow they did (top photo), and I have no doubt the President could hear them. It was loud, literally, painfully loud. The most important piece of kit in my bag for these protests is not a wide angle lens or telephoto lens or memory cards. The most important piece of kit in my bag is ear plugs. There's a lot going on in this photo. These women work in a bank on Sukhumvit Road. There's a McDonald's and Starbucks in the building. 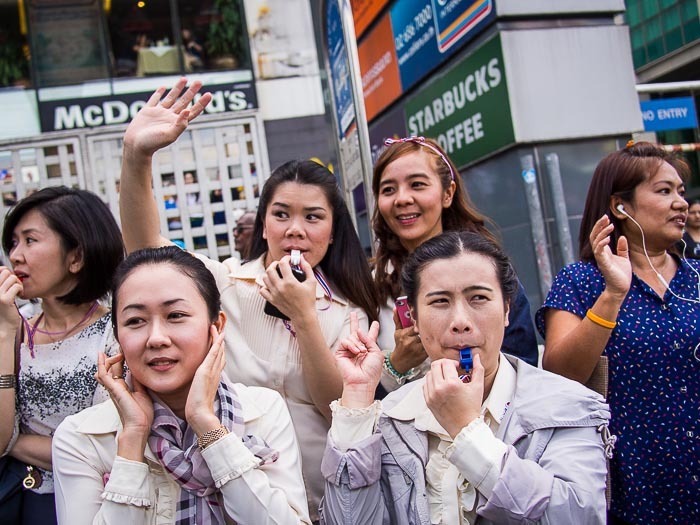 The women represent the Bangkok middle class and they're the heart of the protest movement. There are more photos of Friday's march to the US Embassy in my archive or available from ZUMA Press. I also have photos from the anti-government movement (and opposing pro-government Red Shirts).